With this book, you can teach yourself beginning data structures in C++ with ease! The book is very readable! Check out the table of contents to see what’s covered. See for yourself what you can learn to do! With this book, you will learn to write all of the samples in the data structures link. Note: to write programs like those in the games and windows samples, you will need to learn much beyond beginning data structures, so check my Blog article on which path is right for you. Beginning Data Structures in C++ begins with a short analysis of functional abstraction which serves as a review of basic C++ programming operations especially array and structure processing actions. This includes Top-down design, stub testing and testing oracles. In fact, every example in Beginning Data Structures in C++ has an associated testing oracle to solidify how programs can be fully tested. User header files and multi-source files are used throughout the book. Next, Beginning Data Structures in C++ presents pointers and dynamic memory allocation in depth, since these operations form the foundation of data structure implementations. Recursive functions are also discussed, but adds a powerful sample program that illustrates a superb use for recursion. Beginning Data Structures in C++ presents the concepts of data abstraction along with with many illustrations of the different types. Key emphasis is on growable arrays or vectors, abstract data types (classes), linked lists, stacks and queues. The idea of a growable array is illustrated using structures as a “record” type data structure. Variant record implemented using unions are illustrated with solid examples. 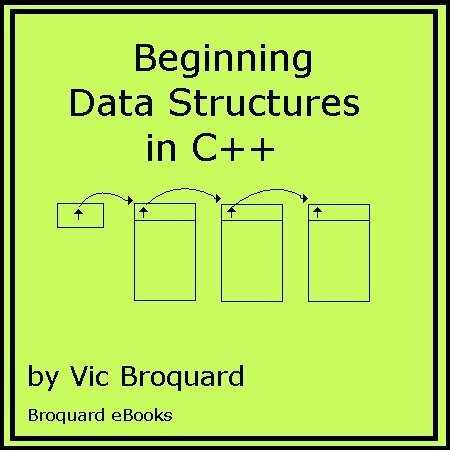 Two chapters of Beginning Data Structures in C++ present classes and their construction and use (abstract data types). However, the emphasis of class design is upon those elements that are required for data structure implementation and simple ADTs. No attempt has been made to turn this into an OOP primer. With an understanding of classes, the next series of chapters explore single and double linked lists, stacks and queues in great detail with many examples. Next, Beginning Data Structures in C++ discusses in depth binary file processing techniques including Inquiry and Update programs, relative record method, remainder method and ISAM methods. Hashing techniques are covered as they relate to direct file processing. Trees are covered including binary trees and binary searchable trees. The programming example illustrates how to construct a binary search tree for an ISAM data base. The last chapter of Beginning Data Structures in C++ discusses the broad topic of sorting algorithms including straight selection, bubble, Quicksort, Heapsort and Shellsort. A benchmark program is also presented along with methods for timing and random number generation. So see for yourself and read a complete chapter of Beginning Data Structures in C++. One appendix provides a review of single and multiple dimensioned array processing and structure processing. The other appendix discusses in depth how to use Microsoft’s Visual C++ 6.0 compiler as well as 7.0 (.NET). All sample programs are designed to use the VC .NET 2005 compiler or higher. Beginning Data Structures in C++ can be used as an entry level course in data structures using C++ object oriented techniques. It meets the CS II course requirements. It is in use at Illinois Central College in the Cmpsc 212 Data Structures I course. This edition has been updated to support Microsoft’s Visual Studio .NET 2005 compiler and the .NET 2008 compiler. Beginning Data Structures in C++ comes in Adobe pdf files. One file contains the entire book. There are also individual chapter pdf files. All of the sample programs are provided as well as the test data needed for some of the programming assignments are provided. If you do not have the Adobe Reader, Get Adobe Reader by clicking this link.